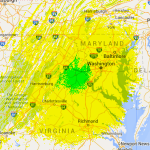 The Virginia Packet Network is in the conceptual phase at the moment. All the patterns available for viewing on this site are for planning purposes only. Should the network become live we will augment the pattern predictions with observation reports. 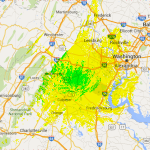 The primary service area for the VAPN is in and around Fauquier County, Virginia. 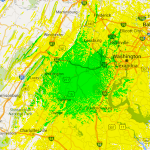 Our secondary service region is as much of Virginia as we can reasonably cover with the available amateur bands. Several suitable sites with elevation and utilities are known to the planners and discussions are ongoing with one in particular. With an HAAT of 176 meters, this site is used for the coverage predictions made with Radio Mobile using conservative radio parameters. A fundamental tenet of the VAPN is to remain an RF only BBS and Chat service. With only VHF and UHF this limits the service area considerably. Some plans include the possibility of remote access UHF ports that will tie directly to the BBS through a dedicated link using Part 15 radios. This differs from the traditional connect-to-a-node-through-another-node tradition. More immediate plans are to include several lower frequency ports to benefit from the terrain busting wavelengths, generally longer reach and generally larger service area. Our primary goal is and will remain providing a single BBS site to cover as much of the Virginia region as practical. Help us help you by taking a moment to share your thoughts in our guest list. If you leave an email address, we will let you know when the system comes online. Given the choices for RF access, which band(s) would you use to access the VAPN?